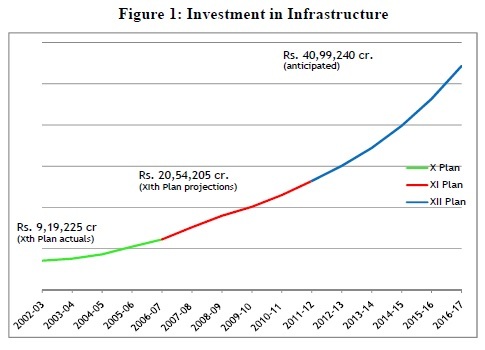 Investment in infrastructure as a ratio to GDP was expected to increase from 5.7 at the end of the Tenth Plan to 8 percent in the terminal year of the Eleventh Plan. It is anticipated that infrastructure investment as a percentage of GDP would be 10 percent in the terminal year of the Twelfth Plan. 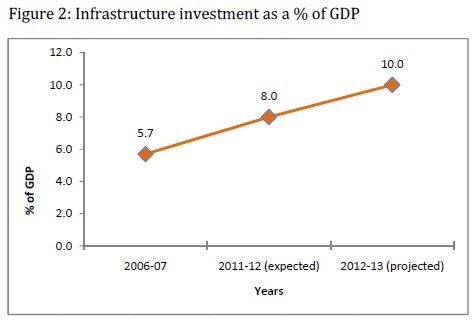 Figure 2 depicts the investment of infrastructure as a percentage of GDP over the Tenth and Eleventh Five Year Plans. It also shows the projected percentage for the Twelfth Plan.Data published in May 2011 shows that the United States of America invests 2.5 percent of its GDP in infrastructure against China’s 9 percent and Europe’s 5 percent. The sectoral analysis of investment made in infrastructure sector reveals that electricity continues to absorb about one-third of the total investment in both the Plan periods followed by the road sector at approximately 15 percent. However, the rate of increase has been the highest in telecom, airports and oil and gas pipelines between the Tenth and Eleventh Five year Plans. Some of the important infrastructure development programmes include the National Highway Development Programme (NHDP) for development of National Highways. It has been one of the most successfully rolled out programmes till date. The Pradhan Mantri Grameen Sadak Yojana (PMGSY) is a programme for the development of rural roads to connect over 1,000 habitations with all-weather roads. To develop and integrate the North-Eastern states with the country, a programme called Special Accelerated Road Development Programme for the North Eastern region is being implemented. A massive programme for urban renewal has been undertaken through the Jawaharlal Nehru National Urban Renewal Mission (JNNURM) by focussing on urban infrastructure. Rural infrastructure comprising irrigation, roads, housing, water supply, electrification and telecom connectivity is being undertaken through Bharat Nirman. In the power sector, electricity is proposed to be provided to all rural households under the Rajiv Gandhi Grameen Vidyutikaran Yojana (RGGVY). The Twelfth Plan Approach Paper stated that the thrust on accelerating the pace of investment in infrastructure should continue for reasons of accelerating growth. However, since there would be a continued strain on public resources during the Twelfth Plan due to their requirement in backward and remote areas, private investment would be required to meet the targets. Traditionally, infrastructure development in India has been financed through public investments, especially by the Central Government rather than the State Governments although, of late, investments from the States have also been forthcoming. The share of the Central Government has gone down from 40 percent of the investment in the Tenth Plan to 34 percent in the Eleventh Plan. The share of the State Governments has also declined from 35 percent to 30 percent between the Tenth and the Eleventh Plans. 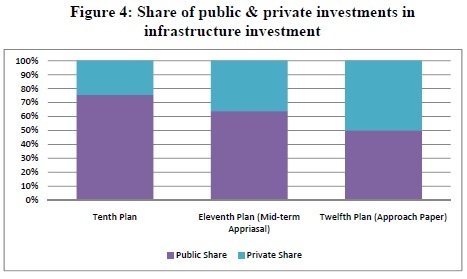 It naturally follows that the share of private investment is increasing steadily as can be seen from Figure 3. 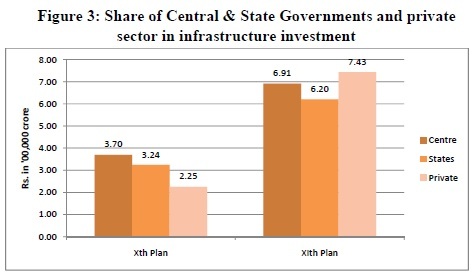 The share of the public sector in infrastructure investment has gone down from 75 percent in the Tenth Plan to 36 percent in the Eleventh Plan and expected to go down further to 50 percent during the Twelfth Plan. The big thrust to infrastructure investment has come due to the participation of the private sector. Public Private Partnerships (PPPs) have been the primary means of channelizing private investment into infrastructure sector which is considered rather unattractive by the private sector for reasons of poor return and long gestation periods. The rationale for PPPs lies in not only supplementing scarce public resources but also in harnessing private sector efficiencies to provide quality services to the public at large. Public Private Partnerships are intended to meet the public objectives of infrastructure provisions through private means. These are sought to be achieved by way of long-term contract agreements which specify the standards and specifications of the assets to be constructed and maintained. Most of these projects are user-charge based wherein the authority to collect the user charge/ toll/fee is delegated to the private partner. Concerted efforts have been made by the government towards creating an enabling environment for the development and long-term sustainability of PPPs. These include the setting up of an institutional framework comprising an appraisal and approval mechanism, schemes of financial support including the Viability Gap Funding (VGF) Scheme. In 2004, a Committee on Infrastructure (CoI) was constituted under the chairmanship of the Prime Minister for evolving policies with a view to creating world class infrastructure in the country. In 2009, the CoI was replaced by a Cabinet Committee on Infrastructure (CCI), also under the chairmanship of the Prime Minister. A committee called the PPP Appraisal Committee (PPPAC) has been constituted to appraise and recommend PPP projects for approval. An Empowered Institution (EI) has been set up for the purpose of sanctioning VGF to state level PPP projects. Under the VGF scheme, the Central Government provides grant of upto 20 percent of the project cost to the private entity for implementing a PPP project. In the last financial year, a total of 390 projects were approved by PPPAC and EI involving a total investment of Rs. 3,05,010crore. A dedicated organization, called India Infrastructure Financing Corporation Limited (IIFCL) has been set up to provide low cost and long-term funds to PPP projects. The Central Government has evolved and mandated standardized bidding documents for PPP projects in infrastructure sector. Further, Model Concession Agreements (MCAs) have been developed for the implementation of PPP projects. The bidding documents as well as the MCAs provide considerable flexibility for project-specific changes. Standardization enables adoption of international best practices in the Indian context. Public Private Partnerships have been undertaken in roads, ports, airports, urban transport and power transmission at the Central Government level. At the State Government level, such partnerships are flourishing in sectors such as water supply and sanitation, solid waste management, etc. Some representative PPP projects are Delhi, Mumbai Hyderabad and Bangalore airports, Jhajjar transmission project in Haryana, Hyderabad and Mumbai metro rail projects, Jaipur Kishangarh National Highway, Gurgaon Expressway, container terminals at Tuticorin, Chennai and JNPT, Ultra mega power projects, concessions for operation of container trains. In one of its reports, the World Bank has stated that India has been the top recipient of PPI activity since 2006. It accounted for almost half of the investment in new Private Participation in Infrastructure (PPI) projects in developing countries implemented in the first semester of 2011 and remained the largest market for PPI in the developing world. A report prepared by the Asian Development Bank states that India stands in the same league as developed economies like South Korea and Japan on implementation of PPP projects. On a score of 100, Australia got the highest score of 92.3, followed by South Korea 71.3, India 64.8 and Japan 63.7. It is widely believed that there is considerable appetite in the market to absorb infrastructure, including PPP projects. However, there are delays related to land acquisition and environmental clearances. Long term funds are also not easily available and banks have reached exposure limits related to sectoral lending. To mitigate the aforesaid constraints related to absence of long term debt in the market, the Finance Ministry has approved the mechanism for setting up infrastructure debt funds. The intent is to provide refinancing to projects once they are into commercial operations. The infrastructure debt funds would be able to attract insurance and pension funds which are long term in nature. Infrastructure development needs sustained investments of a long-term nature. Not only is a rigorous monitoring of sector-wise targets critical for the success of the entire investment programme, it is also necessary for the policy environment to be dynamic in nature so as to adapt easily to the global economic environment. Further, since private investment is expected to flow in through PPPs for the development of infrastructure, it is imperative that the institutional structures are strengthened and investment decisions are based on well-laid down principles so as to avoid future liabilities for the government. The Twelfth Plan will, perhaps, propel the economy into a high growth trajectory. That would be possible only if infrastructure develops at a pace faster than the economy. 2. A PPP Performance Review Unit (PRU) at the Ministry or State Government level, as the case may be. The PMU is to prepare a report to be submitted to PRU within 15 days of the close of the relevant month. The report is to cover compliance of conditions, adherence to time lines, assessment of performance, remedial measures, imposition of penalties, etc. The PRU is to review the reports submitted by the different PMUs and oversee or initiate action for rectifying any defaults or lapses. This is an important governance mechanism in an area which will see a lot of activity in future. It will ensure good governance, accountability, efficiency and economy in spending. The Planning Commission will have a central role in ensuring high quality monitoring. The Cabinet will have a chance to monitor every quarter.